In The Internet Imaginaire, sociologist Patrice Flichy examines the collective vision that shaped the emergence of the Internet—the social imagination that envisioned a technological utopia in the birth of a new technology. By examining in detail the discourses surrounding the development of the Internet in the United States in the 1990s (and considering them an integral part of that development), Flichy shows how an entire society began a new technological era. The metaphorical “information superhighway” became a technical utopia that informed a technological program. The Internet imaginaire, Flichy argues, led software designers, businesses, politicians, and individuals to adopt this one technology instead of another. Flichy draws on writings by experts—paying particular attention to the gurus of Wired magazine, but also citing articles in Time, Newsweek, and Business Week—from 1991 to 1995. He describes two main domains of the technical imaginaire: the utopias (and ideologies) associated with the development of technical devices and the depictions of an imaginary digital society. He analyzes the founding myths of cyberculture—the representations of technical systems expressing the dreams and experiments of designers and promoters that developed around information highways, the Internet, Bulletin Board systems, and virtual reality. And he offers a treatise on “the virtual society imaginaire,” discussing visionaries from Teilhard de Chardin to William Gibson, the body and the virtual, cyberdemocracy and the end of politics, and the new economy of the immaterial. Understanding computers : today and tomorrow, 11th ed. Understanding Computers: Today and Tomorrow gives a classic, well-rounded introduction to computer concepts with a modern twist! Known for its readability and breadth of topics covered, this book will ensure that you have the comprehensive, current knowledge of computer concepts and issues needed to succeed in our technocentric society. This 11th Edition offers exciting new features and updates to make its content more approachable and meaningful. Most design pattern books are based on C++ and Java. But Ruby is different—and the language’s unique qualities make design patterns easier to implement and use. In this book, Russ Olsen demonstrates how to combine Ruby’s power and elegance with patterns, and write more sophisticated, effective software with far fewer lines of code. After reviewing the history, concepts, and goals of design patterns, Olsen offers a quick tour of the Ruby language—enough to allow any experienced software developer to immediately utilize patterns with Ruby. The book especially calls attention to Ruby features that simplify the use of patterns, including dynamic typing, code closures, and “mixins” for easier code reuse. Fourteen of the classic “Gang of Four” patterns are considered from the Ruby point of view, explaining what problems each pattern solves, discussing whether traditional implementations make sense in the Ruby environment, and introducing Ruby-specific improvements. You’ll discover opportunities to implement patterns in just one or two lines of code, instead of the endlessly repeated boilerplate that conventional languages often require. Design Patterns in Ruby also identifies innovative new patterns that have emerged from the Ruby community. These include ways to create custom objects with metaprogramming, as well as the ambitious Rails-based “Convention Over Configuration” pattern, designed to help integrate entire applications and frameworks. Author Tommy W.S. Chow, Siu-Yeung Cho. This book covers neural networks with special emphasis on advanced learning methodologies and applications. It includes practical issues of weight initializations, stalling of learning, and escape from a local minima, which have not been covered by many existing books in this area. Additionally, the book highlights the important feature selection problem, which baffles many neural networks practitioners because of the difficulties handling large datasets. It also contains several interesting IT, engineering and bioinformatics applications. Author editors, P. Pelliccione … [et al.]. It has been argued that fault tolerance management during the entire life-cycle improves the overall system robustness and that different classes of threats need to be identified for and dealt with at each distinct phase of software development, depending on the abstraction level of the software system being modelled. This book builds on this trend and investigates how fault tolerance mechanisms can be applied when engineering a software system. In particular, it identifies the new problems arising in this area, introduces the new models to be applied at different abstraction levels, defines methodologies for model-driven engineering of such systems and outlines the new technologies and validation and verification environments supporting this. Author Andre Neubauer, Jurgen Freudenberger, Volker Kuhn. Coding Theory: Algorithms, Architectures and Applications provides a concise overview of channel coding theory and practice, as well as the accompanying signal processing architectures. The book is unique in presenting algorithms, architectures, and applications of coding theory in a unified framework. It covers the basics of coding theory before moving on to discuss algebraic linear block and cyclic codes, turbo codes and low density parity check codes and space-time codes. Coding Theory provides algorithms and architectures used for implementing coding and decoding strategies as well as coding schemes used in practice especially in communication systems. * Covers standard coding schemes such as block and convolutional codes, coding schemes such as Turbo and LDPC codes, and space time codes currently in research, all covered in a common framework with respect to their applications. With cutting-edge materials and minute electronic devices being produced by the latest nanoscale fabrication technology, it is essential for scientists and engineers to rely on first-principles (ab initio) calculation methods to fully understand the electronic configurations and transport properties of nanostructures. It is now imperative to introduce practical and tractable calculation methods that accurately describe the physics in nanostructures suspended between electrodes. This timely volume addresses novel methods for calculating electronic transport properties using real-space formalisms free from geometrical restrictions. The book comprises two parts: The first details the basic formalism of the real-space finite-difference method and its applications. This provides the theoretical foundation for the second part of the book, which presents the methods for calculating the properties of electronic transport through nanostructures sandwiched by semi-infinite electrodes. Author Liqiu Wang, Xuesheng Zhou, Xiaohao Wei. Many phenomena in social, natural and engineering fields are governed by wave, potential, parabolic heat-conduction, hyperbolic heat-conduction and dual-phase-lagging heat-conduction equations. These equations are not only appropriate for describing heat conduction at various scales, but also the most important mathematical equations in physics. The focus of the present monograph is on these equations: their solution structures, methods of finding their solutions under various supplementary conditions, as well as the physical implication and applications of their solutions. Therefore, the present monograph can serve as a reference for researchers working on heat conduction of macro- and micro-scales as well as on mathematical methods of physics. It can also serve as a text for graduate courses on heat conduction or on mathematical equations in physics. Author G.G. Chowdhury and Sudatta Chowdhury. Tomorrow’s LIS professionals will have to be conversant with all the tools and techniques for organizing information in different domains – from the traditional library shelf to full-scale digital libraries. This core text covers the organization of the entire spectrum of information, and the principles, tools and techniques needed to do this effectively. The most up-to-date textbook yet available on this subject, this comprehensive book covers everything from traditional cataloguing and classification through to metadata, information architecture and the semantic web. Written by experienced academics in the area, who have authored several other successful textbooks, this book provides both an overview of the whole field of information organization and an easy-to-understand introduction to each of the individual topics, which can be followed up with further study by following the references at the end of each chapter.The chapters cover: organizing information – what it means; organizing information in different non-library environments; cataloguing; bibliographic formats – MARC21 and others; library classification; subject heading lists and thesauri in information organization; organization of internet information resources; metadata; markup languages; ontology; information architecture; the semantic web; and, information organization – issues and trends. A key student text for all information and library studies courses, the book is also valuable for practising LIS professionals who need to gain an understanding of the various tools and techniques required to master information organization. Computer graphics comprises the creation and representation of simple graphical elements and images, as well as modern techniques for rendering a virtual reality. To apply these techniques correctly, one requires a basic understanding of the fundamental concepts in graphics. This book introduces the most important basic concepts of computer graphics, coupling the technical background and theory with practical examples and applications throughout. Its user-friendly approach enables the reader to gain understanding through the theory at work, via the many example programs provided. With only elementary knowledge of the programming language Java, the reader will be able to create their own images and animations immediately, using Java 2D and/or Java 3D. Written for second year undergraduates and above, this reader-friendly, clear and concise textbook will be an essential tool for those studying Computer Science and Computer Engineering. Frank Klawonn has many years of experience teaching computer graphics and coordinating application projects with companies. 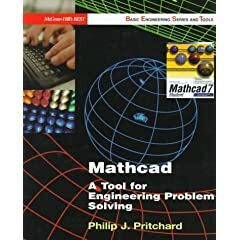 Mathcad : a tool for engineering problem solving, 2nd ed. “Mathcad: A Tool for Engineering Problem Solving” explains how to use Mathcad 13(Student and Standard). This book is current with the latest release of mathcad, with the focus on the fundamentals, is enriched with great motivating applications, solid homework problems, appealing to both engineers and scientists. Electronic Security Systems is a book written to help the security professional understand the various electronic security functional components and the ways these components interconnect. Providing a holistic approach to solving security issues, this book discusses such topics as integrating electronic functions, developing a system, component philosophy, possible long-term issues, and the culture within a corporation. The book uses a corporate environment as its example; however, the basic issues can be applied to virtually any environment. For a security professional to be effective, he or she needs to understand the electronics as they are integrated into a total security system. Electronic Security Systems allows the professional to do just that, and is an invaluable addition to any security library. Working at a Small-to-Medium Business or ISP, CCNA Discovery Learning Guide is the official supplemental textbook for the Working at a Small-to-Medium Business or ISP course in the Cisco® Networking Academy® CCNA® Discovery curriculum version 4.1. The course, the second of four in the new curriculum, teaches networking concepts by applying them to a type of network you might encounter on the job in a small-to-medium business or ISP. After successfully completing the first two courses in the CCNA Discovery curriculum, you can choose to complete the CCENT® (Cisco Certified Entry Network Technician) certification exam, which would certify that you have developed the practical skills required for entry-level networking support positions and have an aptitude and competence for working with Cisco routers, switches, and Cisco IOS® Software. Ruby on Rails offers the ability to rapidly design and write high-quality code with elegance and maintainability. Written by an experienced web application developer, this book explains how to take good Rails code and turn it into beautiful Rails code: simple, effective, reusable, evolvable code. He discusses the very latest in design patterns, programming abstractions, and development methodologies that have emerged for the modern web. With each design technique, youll discover how to make your own additions to Rails and craft a development environment tailored to your specific needs. The Web 2.0 and social software explosion has the capability to transform the online profile of libraries and help reach out to tech-savvy young users to whom the library may be invisible. Libraries can now easily collaborate and create online communities, as well as explore new ways in which to communicate with, educate and attract new users – and also to market themselves. This new book from acclaimed author, Phil Bradley takes a clear and practical approach as it explains exactly how to use the different types of Web 2.0 technologies, and, using examples, shows how libraries can get the most out of them. Illustrations help guide readers through each step of creating a range of resources, and a collaborative, Web 2.0 companion website managed by the author ensures that readers are kept up to date with developments in this highly dynamic and fast-moving area.Coverage includes: what is Web 2.0? ; RSS; weblogs; finding your voice – using podcasts; start pages; social bookmarking services; build your own search engines; creating and using websites and pages; using instant messaging; photograph-sharing utilities; and, implementing Web 2.0. This is essential reading for library and information professionals wishing to harness the social networking revolution to their advantage. It will also be valuable for website authors and students of library and information studies. With Google Apps, you and your colleagues or friends can check email, schedule meetings, chat in real time, collaborate on documents, and more. You can create your own personalized web and email addresses, and get loads of free storage. You can connect with others and access your documents 24/7, no matter where you are. Best of all, it’s all hosted by Google—you get the same bandwidth, service, and machines that Google provides its staff and other online clients, and there’s no hardware or software for you to install or maintain. Google Apps Administrator Guide is for aspiring and practicing webmasters or IT Professionals from any small business, university, college, eBay shop, charity organization, or any other kind of group that wants to work together. That means you can work with colleagues and friends in a single-sign-on web workspace. This book begins by explaining the often tricky and technical work of preparing your domain to work properly with Google Apps in friendly, layman’s terms. That includes registering your domain, explaining zone files, transferring existing email accounts and web pages to your new domain and email system, and creating user accounts. Then it’s time to start building your workspace by customizing how Google Apps interacts with your domain, and deciding which services you choose to provide for your users and employees, and/or friends and family. This book also discusses more advanced techniques for working online with Google Apps, including adding administrators, sharing calendars, editing web pages, and much more. Because Google Apps is always gaining new functionality, this book provides online updates and bonus chapters at http://bolesbooks.com/thomson/. Those online updates contain any major changes to Google Apps and help make sure your Google Apps Administrator Guide will always be up-to-date. This is the only book you will ever need to master Google Apps! This book presents state-of-the-art cross-layer optimization techniques for energy-efficient information processing and routing in wireless sensor networks. Besides providing a survey on this important research area, three specific topics are discussed in detail – information processing in a collocated cluster, information transport over a tree substrate, and information routing for computationally intensive applications. The book covers several important system knobs for cross-layer optimization, including voltage scaling, rate adaptation, and tunable compression. By exploring trade-offs of energy versus latency and computation versus communication using these knobs, significant energy conservation is achieved. Author Robert A. Pease, editor with Bonnie Baker … [et al.]. All the design and development inspiration and direction an analog engineer needs in one blockbuster book! Digital copyright is still a developing area, and is a potential minefield for information professionals. In the UK there is no Act of Parliament specifically addressing copyright for materials in digital form. Rather the profession is reliant on the Copyright, Designs and Patents Act 1988, and how this relates to machine-readable content. This book examines in depth how digital content is treated differently from hard-copy material. The second edition includes a new chapter that takes an in-depth look at digital rights management (DRM). It takes account of the All Party Internet Group’s findings of their public inquiry into DRM, published in June 2006; and the Gowers Review of Intellectual Property of December 2006. It also offers a new section on copyright clearance for digital content; current examples of the penalties imposed for file sharing, piracy and counterfeiting; and additional case law examples.This title covers topics such as: database right; the application of copyright to websites and intranets; the use of screenshots in presentations; hyperlinking and deep linking; how the copyright exceptions apply to digital content; licences, contracts, or a set of terms and conditions; the interface between copyright law and contract law; model licence agreements; The Copyright and Related Rights Regulations 2003: including the newoffences, particularly relating to the removal or alteration of rightsmanagement information; and the question of circumventing technical protection measures such as DRM systems; digital signatures; relevant legal cases; and, further reading. This essential guide will help all information professionals find out what needs to be done to stay within the law in our increasingly digital environment. Readers will be able to build and program their own 8088 single-board computer by applying the interfacing concepts and techniques presented in this book. Coverage begins with the software architecture of the 80×86 family, including the software model, instruction set and flags, and addressing modes. Abundant examples illustrate basic programming concepts such as the use of data structures, numeric conversion, string handling, and arithmetic. Hardware details of the entire 80×86 family are then examined, from pin and signal descriptions to memory and input/output system design. Advanced topics, including protected mode, WIN32 and Linux programming, and MMX technology are also introduced. Guide to UNIX using Linux, 4th ed. Written with a clear, straightforward writing style and packed with step-by-step projects for direct, hands-on learning, Guide to UNIX Using Linux, 4E is the perfect resource for learning UNIX and Linux from the ground up. Through the use of practical examples, end-of-chapter reviews, and interactive exercises, novice users are transformed into confident UNIX/Linux users who can employ utilities, master files, manage and query data, create scripts, access a network or the Internet, and navigate popular user interfaces and software. The updated 4th edition incorporates coverage of the latest versions of UNIX and Linux, including new versions of Red Hat, Fedora, SUSE, and Uuntu Linux. A new chapter has also been added to cover basic networking utilities, and several other chapters have been expanded to include additional information on the KDE and GNOME desktops, as well as coverage of the popular OpenOffice.org office suite. With a strong focus on universal UNIX and Linux commands that are transferable to all versions of Linux, this book is a “must-have” for anyone seeking to develop their knowledge of these systems. MATLAB : an introduction with applications, 3rd ed. If you want a clear, easy-to-use introduction to MATLAB(r), this book is for you! The Third Edition of Amos Gilat’s popular MATLAB(r), An Introduction with Applications requires no previous knowledge of MATLAB and computer programming as it helps you understand and apply this incredibly useful and powerful mathematical tool. By showing you not just how MATLAB(r) works but how to use it with real-world applications in mathematics, science, and engineering, MATLAB(r), An Introduction with Applications, Third Edition will turn you into a MATLAB(r) master faster than you imagined. Based on the highly successful classic, Robot Dynamics and Control, by Spong and Vidyasagar (Wiley, 1989), Robot Modeling and Control offers a thoroughly up-to-date, self-contained introduction to the field. The text presents basic and advanced material in a style that is at once readable and mathematically rigorous. * A step-by-step computational approach helps you derive and compute the forward kinematics, inverse kinematics, and Jacobians for the most common robot designs. * Detailed coverage of vision and visual servo control enables you to program robots to manipulate objects sensed by cameras. * An entire chapter on dynamics prepares you to compute the dynamics of the most common manipulator designs. * The most common motion planning and trajectory generation algorithms are presented in an elementary style. * The comprehensive treatment of motion and force control includes both basic and advanced methods. * The text’s treatment of geometric nonlinear control is more readable than in more advanced texts. * Many worked examples and an extensive list of problems illustrate all aspects of the theory. Seth Hutchinson iscurrently a Professor at the University of Illinois in Urbana-Champaign, and a senior editor of the IEEE Transactions on Robotics and Automation. He has published extensively on the topics of robotics and computer vision. Mathukumalli Vidyasagar is currently Executive Vice President in charge of Advanced Technology at Tata Consultancy Services (TCS), India’s largest IT firm. Dr. Vidyasagar was formerly the director of the Centre for Artificial Intelligence and Robotics (CAIR), under Government of India’s Ministry of Defense. A helpful companion Web site, http: //cmosedu.com, provides worked solutions to textbook problems, SPICE simulation netlist examples, and discussions concerning mixed-signal circuit design. CMOS circuit design, layout, and simulation, 2nd ed. Author Mauri Kuorilehto … [et al.]. Finally a book on Wireless Sensor Networks that covers real world applications and contains practical advice! Kuorilehto et al. have written the first “practical” guide to wireless sensor networks. The authors draw on their experience in the development and field-testing of autonomous wireless sensor networks (WSNs) to offer a comprehensive reference on fundamentals, practical matters, limitations and solutions of this fast moving research area. Explains the essential problems and issues in real wireless sensor networks, and analyzes the most promising solutions. Provides a comprehensive guide to applications, functionality, protocols, and algorithms for WSNs. Offers practical experiences from new applications and their field-testing, including several deployed networks. Includes simulations and physical measurements for energy consumption, bit rate, latency, memory, and lifetime. Covers embedded resource-limited operating systems, middleware and application software. “Ultra Low Energy Wireless Sensor Networks in Practice” will prove essential reading for Research Scientists, advanced students in Networking, Electrical Engineering and Computer Science as well as Product Managers and Design Engineers. Author edited by Ananthram Swami … [et al.]. The design of wireless sensor networks requires consideration for several disciplines such as distributed signal processing, communications and cross-layer design. “Wireless Sensor Networks: Signal Processing and Communications” focuses on the theoretical aspects of wireless sensor networks and offers readers signal processing and communication perspectives on the design of large-scale networks. It explains state-of-the-art design theories and techniques to readers and places emphasis on the fundamental properties of large-scale sensor networks. “Wireless Sensor Networks” will be of use to signal processing and communications researchers and practitioners in applying classical theory to network design. It identifies researchdirections for senior undergraduate and graduate students and offers a rich bibliography for further reading and investigation. Voice and audio compression for wireless communications, 2nd ed. Voice communications remains the most important facet of mobile radio services, which may be delivered over conventional fixed links, the Internet or wireless channels. This all-encompassing volume reports on the entire 50-year history of voice compression, on recent audio compression techniques and the protection as well as transmission of these signals in hostile wireless propagation environments. “Audio and Voice Compression for Wireless and Wireline Communications, Second Edition” is divided into four parts with Part I covering the basics, while Part II outlines the design of analysis-by-synthesis coding, including a 100-page chapter on virtually all existing standardised speech codecs. The focus of Part III is on wideband and audio coding as well as transmission. Finally, Part IV concludes the book with a range of very low rate encoding techniques, scanning a range of research-oriented topics. Fully updated and revised second edition of “Voice Compression and Communications,” expanded to cover Audio features Includes two new chapters, on narrowband and wideband AMR coding, and MPEG audio coding Addresses the new developments in the field of wideband speech and audio compression Covers compression, error resilience and error correction coding, as well as transmission aspects, including cutting-edge turbo transceivers Presents both the historic and current view of speech compression and communications. Covering fundamental concepts in a non-mathematical way before moving to detailed discussions of theoretical principles, future concepts and solutions to various specific wireless voice communication problems, this book will appeal to both advanced readers and those with abackground knowledge of signal processing and communications. The 2nd UP College of Engineering Library II Academic Book Fair is here! Returned 15 books on time! Returned 14 books on time! Returned 11 books on time! Please claim your prizes at the Circulation Section by presenting your ID. Thank you!